So. I took the CA Bar exam in February 2016, and I passed! Yipee! Can I tell you a story about that day? And a little about the time I spent taking it? I took it in July of 2015 and failed. I think I wrote about that around here somewhere. I basically did two things wrong: I didn't study the right way and short changed myself in time, and then I had a bit of a nervous breakdown in the middle of day 3. Which in hind sight is hilarious. Not so much at the time. The second time, I did things on my own terms. I stayed at a hotel that was nearly 3 miles away from the testing center, and I walked to and from. This longish walk got the jitters out. And helped me sleep better at night. I studied like a boss. Like, I actually wrote out essays instead of just watching review lectures. It helped that this go around I remembered from my first bar review study. Which says a lot because the first time I was like, "Wha?!? I don't remember this AT ALL." Lol. Anyways, on Friday the 13th I found out I passed. Ryan was asleep on the couch and I have no idea where my kids were. Inside, outside, hanging upside down from a tractor... who knows? Let me back up. That day, Ryan and I went our for cheeseburgers, which was a total cheat meal for us. We came home, and I was feeling a might anxious, so I jumped on my bike and out I went. That was kind of a mistake because I almost killed myself coming home up the hill. I haven't ridden in months and boy, did it show. I came home all red faced and sweaty, took a bath, and then sat at my computer at 5:50pm. I logged in to see if maybe, just maybe, results were out a little early. I waited patiently, trying not to think about "what if" I had to study again. Blah. Yuck. Don't know how I could have done any better. I logged in, the computer told me my name was on the pass list, and it happened: I instantly burst into tears and heaving sobs. Hard crying. For an unemotional robot of a woman, this surprised me. And yet, NOT. Because I was so RELIEVED and so GRATEFUL to have made it. I don't think I'll ever forget that feeling. After a few minutes of this sobbing on my bed, I went upstairs to tell Ryan. He was thrilled, of course. I texted the family and a few friends who would want to know. I posted it on Facebook. At first it just said, "I passed the Bar." (I was in shock. I realize this now.) Then I edited it a bit later to add, "I think this calls for ice cream." Totally in shock. This wordy girl was speechless. Anyways, in the 11 days since I found out, the shock is wearing off, and the overwhelm is setting in. It's time to hang a shingle, but not a big one, lol. My mom and wife duties are first, and I am super concerned about providing quality service. I'm irked at the legal profession for having such a terrible reputation as a whole, and at Family Law lawyers for really being some of the worst. So many unhappy clients (my friends and family, actually), who aren't mad that court didn't go how they wanted it to, but rather with the shoddy service they received from their attorney. So yeah, my overwhelm is about a 9 right now. I want everything to be perfect, right, and top notch. No pressure. Ha ha. But I have a plan. I've been working on things. I'm going to niche down and have to just say no to some things. I've got to go take a short walk to stretch my legs, give my eyes a break, and clear my head. Not sure how often I'll update, but if I don't, it's because I fell in love with Instagram and Chatbooks, and I'm busy either with the family, the community, or work. PS: guess who shows up to a meeting and is nominated and voted in as VP of the board for a non-profit? This girl. Wait...it gets better. Which VP forgets to go to a meeting later in the year and is voted in as President of the board? Yup. Me. Of course, right? I hope I do a good job. We've got some fundraising to do. And...I'm totally late. My apologies. My mind has been elsewhere. But, this morning, I sat down at my desk and saw this lonesome copy of the book...so it has to be done today. I need all the brain space I can muster right now. Random.org spit out lucky number 5! Rachel H., I will mail it to you this week. I have your address already. Thank-you all for expressing an interest in "Trailer Life." In case you were wondering, right now I'm reading "Essentialism" by Greg McKeown. It's a good read for anyone who has some goals to meet but is also overly busy. Like me. Totally me. Weeding out and slimming down my commitments and ideas so that I can focus on what I really want. Next book on my list is "The Slight Edge." And, "Magnus Chase and the Gods of Asgard." I still can't believe I wrote a book. 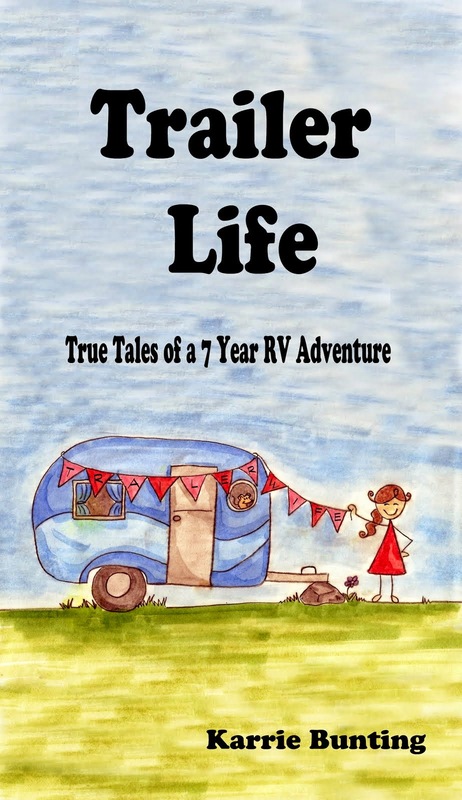 I will number all the entries (one per person, please) and then via a random number generator, choose one person to receive a copy of "Trailer Life." I'll even sign it! Caveat: This is a first edition. In other words, there is a typo on the back cover that escaped my eyes for a month or two. Instead of the word "journey," it says "jounrey." How embarrassing! Seriously. I was so meticulous, and then THAT. This giveaway will be open until January 31, 2016. When I wake up on Monday, February 01, I will pick a winner and then contact you for your mailing address. Before I had children, I really thought that my wonderful lovelies would be able to know what a trashcan was by the time they were, oh...say at least two years old. Three years old? You know, because as a dutiful mom I would have shown them since they began walking where to put trash. Because they would be helping me tidy up and all that. Jessie is almost 8, there are the boys, and then Kacy is 12. I'm still teaching them the concept of a trash can. I'm also still teaching them the concept of "Brushing your teeth without toothpaste is like washing your hair without shampoo. It doesn't WORK." I was sick for a week and a half starting Christmas night. My energy was gone. So, naturally I didn't wander outside to clean out the car. Besides, I had kept reminding them every they got out, "Grab your stuff! Take what's yours into the house." Christmas trash was everywhere. Books, papers, and pencils littered the floor. The thing that was most disgusting was that I stuck my finger in an unknown gooey substance on the floor. Half eaten candy canes were stuck in the cup holders. Orange peels (which smell good for a few days and then DON'T) were littered across the floor. My 10 year old new to me car is supposed to be nice, here people. It looks nice from the outside most of the time. It runs well. But here it is, being used as a trash can. My kids were lucky they were at school because I needed the time to cool down. I was making irrational threats in my head. You know, the threats that go like this: "If they were here they would be in so much trouble. I would make them finish these candy canes that are glued to everything. NO MORE EATING IN THE CAR." Which is a huge joke because honestly, we drive miles and hours just to get anywhere, and we all know a little stuck candy cane is better than listening to whining for an eternity. Those trash can skills...when do they happen?